SanDisk was kind enough to lend us one of their most expensive memory cards, the SDHC 32GB Class 10. With an advertised 30MB/s transfer speed, we couldn’t resist to put it to the test. The capacity alone is enough to heighten any hard-core photographer’s interest. But the cost, convenience, speeds, and compatibility are important factors to consider. So after some benchmarks and real-life use tests in an entry level DSLR camera, here’s what we found. If you are a professional photographer, it’s a pain when your DSLR camera has to freeze up for a few seconds to wait for the data to get copied over from the cache to the memory card. It’s annoying when you realize that you finally have a great camera but the cheap included memory card is a bottleneck. Although speeds aren’t necessarily an issue for casual consumers, those making their way into professional photography will find many situations when fast write speeds are necessary. Sports games and keynote presentations are great examples of when the burst mode demands fast write speeds. SanDisk’s Class 10 SDHC memory cards hopes to solve those problems. These cards claim theoretical transfer rates of up to 30 MB/s. After running some benchmarks, I found that read speeds clocked in at around 26 MB/s and write speeds were around 22 MB/s. A powerful Windows 7 machine took about 14 seconds to copy 50 JPEG images totaling in at 110MB over to the SDHC card. Copying over a single 100MB video file took drastically less time than multiple files that take up the same amount of space. That’s probably due to a file system delay to create a header to a new file. Overall, you won’t need a benchmark tool to tell you that this card is faster. The first time I copied some files over, I saw a noticeable difference over my older SanDisk Extreme 4GB Class 6 card. The Extreme Class 10 SDHC is also perfect for those with new DSLR cameras that sport HD video recording capabilities. The Nikon D5000 or the Canon Rebel T1i are perfect examples. According to SanDisk, the card’s transfer rates apparently surpasses the requirements needed for HD recordings. That makes this an excellent complement for those planning to record HD videos. On another side-note, if you’re into extreme weather photography, the card apparently can operate in temperatures low as 13 F and high as 185 F.
With a premium card, it’s important to include recovery tools. Although it shouldn’t happen, memory cards sometimes get corrupted. Although cameras are designed to avoid issues from abruptly being turned off while saving images, it still happens. SanDisk graciously includes a license to RescuePRO which has a $40 value. If your card were to become unreadable, just install this program. Insert the card and let the program do its work. There’s a good chance that the program will be able to do some magic to recover those images that your standard Windows or Macintosh file system browser can’t do. Skatter Tech was put this to the test on our Canon Rebel XSi during the Consumer Electronics Show in Las Vegas. Snapping images rapidly of glimpses of new products on stage and of rapidly moving sideshow presentations wasn’t an issue with this card. The entire process was smooth, the Class 10 speeds were handy. However, once I threw an included 4GB SDHC Class 2 memory card, the difference was quite apparent. The camera constantly choked up after a few shots. While a Class 10 might not be necessary for everyone, if you have an entry-level DSLR, at least consider getting a Class 6 card. 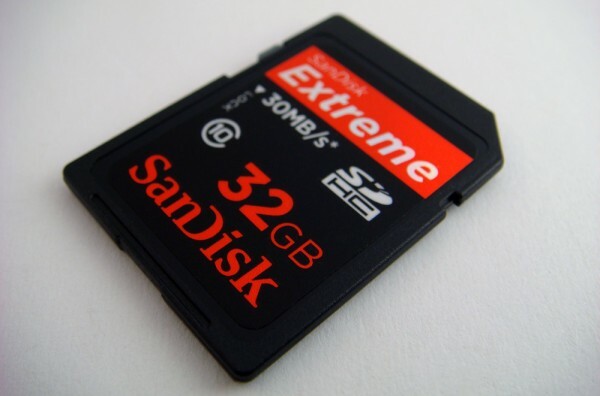 SanDisk offers four Class 10 Extreme SDHC cards in 4GB, 8GB, 16GB, and 32GB capacities. The MSRP for these are $70, $119, $195, and $388, respectively. SanDisk’s pricing is usually drastically higher than what it actually ends up retailing for. For example, the 32GB SDHC card with an MSRP of $388 is actually available for as low as $219 on Amazon.com. For Class 10 cards, the 16GB and 32GB models are available for the most gigabytes per dollar, but those are a bit too expensive for the average consumer to pick up. I would definitely recommend Class 6 SDHC cards to the mass market since they are much cheaper. If you’re a professional photographer, the convenience of not having to swap cards and the ability to record HD videos and snap photos rapidly makes this worth the price. Plus, if there’s ever a problem, SanDisk includes a Lifetime Warranty. I have a Windows 7 computer and would like to use an SDHC card for Readyboost. Would this card be a good choice? What would you recommend for speed and capacity for Readyboost? Would be a good choice. But what are your computer specs? Not too many people need to use Ready Boost these days. Dual core 2.2GHz T6600 with a 500GB hard drive and 4GB RAM. I use an 8GB Verbatim Tuff’n’Tiny with 4GB dedicated to Readyboost that provides a noticeable increase in smoothness when I slip it in after streaming videos get a little glitchy without it; it seems to improve performance by helping with buffering on slower internet connections. I love the Tuff’n’Tiny but I would like to try augmenting it with something I can leave in the computer. I doubt the flash drive is helping you with performance. Even if the SDHC card is faster than the current flash drive you are using, both are almost completely likely to be slower than the RAM in your machine. ReadyBoost was for computers that had slow or little RAM that couldn’t be upgraded. 4 GB is a pretty darn good amount. Unless you are running some very resource intensive apps or are an extreme heavy duty multitasker, you should be just fine with what you have. All I can say is that I can see the difference. It seems from the descriptions of how Readyboost runs that its effectiveness is based on hard drive, not RAM. I don’t have an SSD and I do see a difference under the conditions I mentioned. If you are noticing improvements, by all means use it. Sorry, I didn’t mean to try to invalidate your experience. I was just saying what I’ve heard, which was that if you aren’t using up all the 4GB of RAM you have it won’t make a difference. P.S. I completely agree with Microsoft about not needing ReadyBoost with SSDs. It would be nice to involve Microsoft and/or Verbatim in the discussion. Microsoft’s recommendations for Windows 7 are quite confused. They do recommend devices that are “Enhanced for Readyboost”, as is my Verbatim Tuff’n’Tiny. So I’ve been using a 4GB SDHC Class 6 for the past few days. I don’t know whether it’s a placebo effect, but I feel as though my computer has been snappier. I multi-task a lot and often use over 3GB of my 4GB of RAM. I usually notice lags with certain applications including browsers and editing tools when I restore minimized windows for instance. Since I threw in that extra 4GB card I had lying around, everything feels smoother. I’m excited about your willingness to try this and I am excited about your observations so far! I have some meaty information/observations that I have unearthed in the past few days but I will save them to preserve the purity of your ongoing observations. How much of your 4GB card have you allocated to Readyboost? I’m using the full 4 GB.